For the clarification of any conception, the explanatory statement that which is based on the conclusion of the perceptible uses, can be called a theory. After studying the conditions taking place in learning, the psychologists, on the basis of observation, analysis and synthesis, by the scientific method and by the experiments, have presented a collected opinion, which are the theories of learning. Here Skinner’s Operant Conditioning Theory has been described in detail. Respondent Behavior—This type of behavior lives under control of stimulus. For example, the excreting of saliva after taking food in the mouth is respondent behavior. Other examples of respondent behavior can be given by the experiment of Pavlov in addition of this example, as- to close the eyes after throwing the light, to move away the hand after piercing the pin and to draw away the hand after touching the hot thing. Operant Behavior—This kind of behavior is somewhat different from the above behavior. This behavior is not under the direct control of stimulus. It is embed in the self desire of learner. Operant behavior does not happen until a man is willingly ready for doing this type of behavior. For example in the experiment of Skinner, the behavior of rat is operant. In the same way after ringing the bell, opening the door or not depends upon the desire of a man. On ringing the bell, opening the door related behavior is operant behavior. In the experiment of Skinner, for getting the reward, rat operates the lever. Therefore this type of learning is called Instrumental Conditioning. He considered learning as the changing process happening in the behavior like other behavioralists. He accepted conditioning as the reason of learning, but his conditioning process is quite different. In fact before delivering his learning theory, he did historical survey of already-done learning related studies and analyzed the creativity of concept and reflex. According to him, the fundamental basis of human behavior is observed in the correlation of stimulus response relationship. In the explanation of human behavior, former psychologists delivered the concept of reinforcement, which Skinner developed through schedules of Reinforcement further. He has imagined a such version of society in his ideal novel ‘Walden Two’ in which human behavior can be determined and controlled in a well organized way by awarding prize. According to Skinner we should see and ponder on the earlier environment, in order to know the reason of any types of behavior. For example the origin of criminal tendency in the adolescence is due to some qualities of environment. Changing environment is important for the changing of behavior. He has considered stimulated process very important. He has considered the external observation capable behavior as an important subject of psychology because it can be seen experienced and evaluated and this behavior can be investigated scientifically. A man’s behavior can be determined and controlled by the rules of learning. Skinner has described two types of behavior—Stimulus produced behavior and action produced behavior. Whose responses go on and produce due to the known stimulus, is called produce stimulus behavior. It is necessary for action produce stimulus to have connection with some known stimulus. Stimulus produced and action produced response are related to conditioning, which we called S or R types. The connection of S types conditioning with stimulus produce behavior is so, because reinforcement is connected to stimulus. It has been clarified with the theory of Pavlov. S types conditional stimulus ( sound of bell) has been presented with unconditional stimulus(food),which obtain the quality of unconditional stimulus. R type conditioned is which called action produce is conditioning. Action produce conditioning is known by the name of Operant conditioning. Here operant conditioning name has been used. Some psychologists have called operant conditioning by the name of Instrumental learning and Instrumental conditioning, because it includes the learning of such responses which are accomplished. It is a medium in achieving the food, in the solution of suffering and punishment and obtaining the goal. So some psychologists have called it as ‘material conditioning’. Pavlov’s classical conditioning does not accomplish anything, in it, there is only the establishment between stimulus and response. Skinner’s Box—Experiment, which has been described further, clarifies the instrumental learning and in fact the fundamental symptoms of most of a man’s learning. Man, in the beginning, is motivated by some purpose, such type of response happen within the motivation general concluded process, which is used as a medium in the achievement of goal. Thus, in the attainment of any special goal whatever learning takes place, it is called instrument. Like the Pavlov’s classical conditioning, Reinforcement is an important element for the learning of Instrumental learning. All the elements of classical conditioning are found in the operant conditioning. Yet there are some differences in them. In Pavlov’s classical conditioning theory, a dog was tied with the table and did not perform any action. In the experiment of Skinner rats are active. So this theory has been called operant (which is originated from the action) theory. Being operated, a creature gets some instrument and after doing again and again he reinforces that instrumental process. This name depends on the fact that a man does action for getting some reward or doing reinforcement in his environment; reinforcement is the attainment of that goal, which can satisfy motivation, as- in the ‘Skinner Box’ having the food of a hungry rat was the reinforcement. Skinner, who has used action produce and operant words, according to him, behavior is to do action for the obtaining any result towards environment, as- food, water, or achievement of any reward. It is clear that Instrumental learning or name of conditioning is the behavioral side of operant conditioning theory. In the theory of Skinner, operant is the main thing, so it is important to understand it. This conclusion comes from the above opinions that operant is the some kind of behavior, but this behavior does not remain under the control of its former stimulus. It is the quality of operant behavior, that it is operated on the environment and generates outcome. According to Skinner, operant behavior is generated by the man not by stimulus. He has used the word ‘operant’ for this reaction. 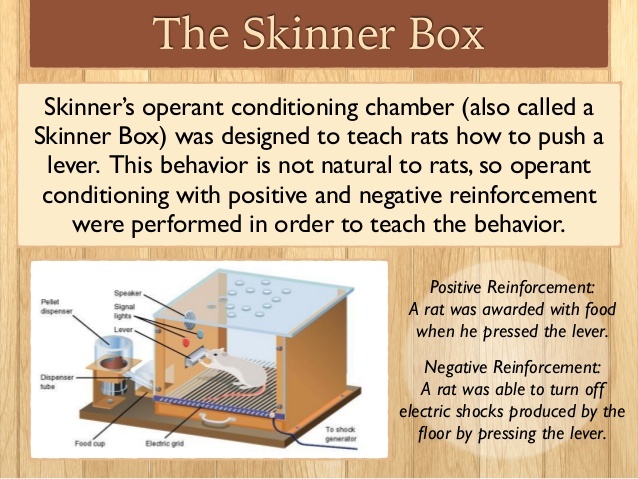 Skinner did many experiments to display the process of operant conditioning. Operant conditioning theory can be learnt by his one important experiment. Skinner did not see in his experiment under which conditions does the lever presses, rather he watches the event of response by pressing the lever. He considers this response as an emitted response. According to Psychologist Stephens—This theory can be understood in this way—“whichever type of study includes such emitted responses, it is the suggestion of Skinner for their explanation, whatever response help in the reinforcement that will be reinforced, means the response will be more reinforced. This is the general tendency of above response, which is reinforced, that this response is reinforced only. It is not any S R tendency or condition. 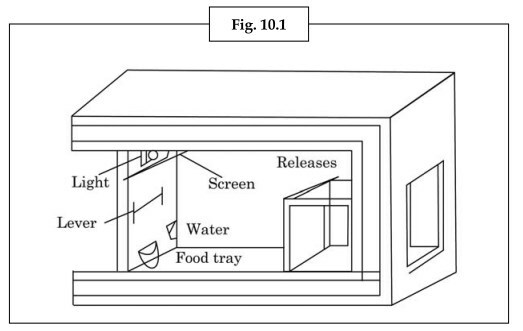 Rat presses the lever and gets the food, thus rat’s possibility of pressing the lever is developed and this response is reinforced and rat even after having the food, presses the lever.’’ It is clear from the description of this experiment that rat is inspired by the reward (food) and reinforced for doing some actions. Rat’s continued attempts is due to the reinforcement. It is also clear from this experiment that learning is a sequence process, which is developed by the efforts and goes on to be stronger. He did his second experiment on the pigeons. Skinner used another special technique for the experiment on the pigeons, which is called pigeon Box. The experiments done on the pigeon, Skinner put this aim that pigeon, after completing a whole round from the right side, learnt to peck on a certain place. With this experiment, hungry pigeon which was imprisoned in the pigeon box, as soon as flying toward the right side and started to peck on the certain place, he got a grain of wheat. By this wheat it got strength for the repetition of its behavior, and moving towards the right side it respond to peck the beak. Consequently he got a grain of wheat and that’s why the pigeon learnt the way to get the grain (food) by the pecking beak and moving toward the right side. Skinner gave birth to a new conditioning theory in the field of learning by his experiments. He found the conclusion that our learning related behavior is moved by the operant conditioning. Our behavior and response is like operant conditioning to some extent. Skinner gives a lot of importance to reinforcement in his experiment, on which, his learning theory depends. So it is necessary to understand the opinions on reinforcement. Parents and teachers can develop desirable behavior in the children with the help of this theory. Children are encouraged with the reinforcement of desirable behavior. In the class, teacher can do the desirable process of reinforcement by smiling, appreciation, and by giving more marks. The good behavior of children, the reinforcement of getting home work or other success should be done immediately by rewarding him. Attention shall be paid to the needs of children in the different activities of school. This theory encourages for motivation, so, after explaining the object of subject matter, teaching in the class, children should always be inspired in the class. This rule can be used for the improvement of bad behavior of children. The theory of reinforcement can be helped in the skill development, adjustment and social learning of children. ‘Operant Conditioning Theory’ is a method of learning, which was developed by an American scientist B.F. Skinner. His learning related opinions began to spread almost in 1932 century. His two books ‘The Behavior of Organism’ and ‘Beyond Freedom and Dignity’ are famous. Skinner’s name is mainly known in the list of behavioral scholars. This type of behavior lives under control of stimulus. For example, the excretion of saliva after taking food in the mouth is respondent behavior. This behavior is not under the direct control of stimulus. It is embed in the self desire of learner. Operant behavior does not happen until a man is willingly ready for doing this type of behavior. For example, in the experiment of Skinner, the behavior of rat is operant. In the same way after ringing the bell, opening the door or not depends upon the desire of a man. On ringing the bell, opening the door related behavior is operant behavior. Operant Conditioning Theory’ is a method of learning, which was developed by an American scientist B.F. Skinner, who has described the two types of behaviors, Respondent Behavior and Operant Behavior. According to him, the fundamental basis of human behavior is observed in the correlation of stimulus response relationship. In the explanation of human behavior, former psychologists delivered the concept of reinforcement, which Skinner developed through schedules of Reinforcement further. He has imagined a such version of society in his ideal novel ‘Walden Two’ in which human behavior can be determined and controlled in a well organized way by awarding prize.